Shannon's Pressure Washing services clients in the Dawsonville area. With over 5 years of pressure washing experience, we uphold a standard of integrity bound by fairness, honesty, and personal responsibility. 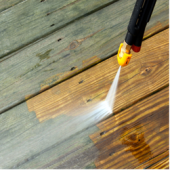 We pressure wash decks, driveways, and other exterior services. Contact us today for more information!